True to the spirit of the all-American athlete and our society's seemingly endless pursuit of and passion for leisure activities is Sports & Recreation Fads. This readable and fascinating reference book highlights some of the most notable as well as some long-forgotten pastimes and personalities. Sporting and recreation events have thrived in the United States for more than two centuries. Just about every sport and recreation embraced from Colonial America to the present has had its faddish aspects. 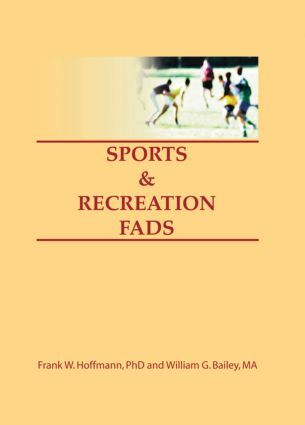 The fascinating introduction provides a basic understanding of the importance of fads in the development of sports and recreation. No book on sports fads would be complete without several chapters on baseball, and this exciting volume is no different--Hank Aaron's 715th home run, baseball card collecting, Mark “the Bird” Fidrych's shining season with the Detroit Tigers, Bo Jackson's double career, Jackie Robinson's success in breaking the color barrier, and Pete Rose's gambling troubles--a true slice of Americana, the best and the worst of our favorite pastime! From the controversial people and events in professional athletics--Mohammed Ali, Joe Namath, Mike Tyson, the “battle of the sexes” between Billie Jean King and Bobby Riggs, the “Black Sox Scandal,” and the Dallas Cowboys cheerleaders, to the heroes--Charles Atlas, Joe Louis, and Babe Ruth, Hoffmann and Bailey illustrate the often fickle and sometimes enduring interest that Americans have for sports figures and their games. This informative and entertaining book also examines our personal quest for fitness, our devotion to automobiling, and our love of games, including bridge, charades, crossword puzzles, Monopoly, Dungeons & Dragons, Scrabble, and Trivial Pursuit. Sports &Recreation Fads is a handy guide to our favorite leisure activities of the last 200 years.